Okay, by now you’re probably thinking, I’m on board with budgeting for Christmas and saving early, but I’m bummed out that I won’t be having as much fun this Christmas. Stop right there, Mr. Grinch! Just because you’re on a budget this Christmas doesn’t mean you have to be a Scrooge and do zero Christmas activities. Grab your sled and pack your eggnog, because we’re about to show you how you can still have some Santa-sized fun while on an elf-sized budget. Are you hosting Christmas dinner for your family or bringing your favorite side dish to a potluck? Plan your Christmas recipes ahead of time so you can wow friends and family with your cooking (and budgeting) abilities. If you’re the one hosting, have everyone bring a dish to share at the big Christmas meal! This will save you a ton of money and a lot of hassle, plus your guests will get a chance to show off their favorite recipes and family traditions. Everyone wants to brag about their Grandma’s famous Lemon Meringue Pie recipe. And remember, if you’re hosting out-of-town guests for more than a day or so, you’ll want to budget even more for extra meals and restaurant visits. Plane tickets and hotel rooms aren’t the only travel costs to account for this time of year. Snacks at the airport, Uber or cab rides, parking, tips, and gas money are some of the smaller expenses that can slip under your radar. Don’t forget to account for these costs before you hit the road! And just because you got an invitation to Aunt Betsy’s fancy Christmas party two states over doesn’t mean Fido did too. If your pet isn’t making the trip with you, make sure to budget for boarding fees. While you’re probably excited to string up Christmas lights as soon as you’re finished eating on Thanksgiving Day, you’ll still want to make a budget before buying that peppermint-scented candle or new addition to your snow village collection. 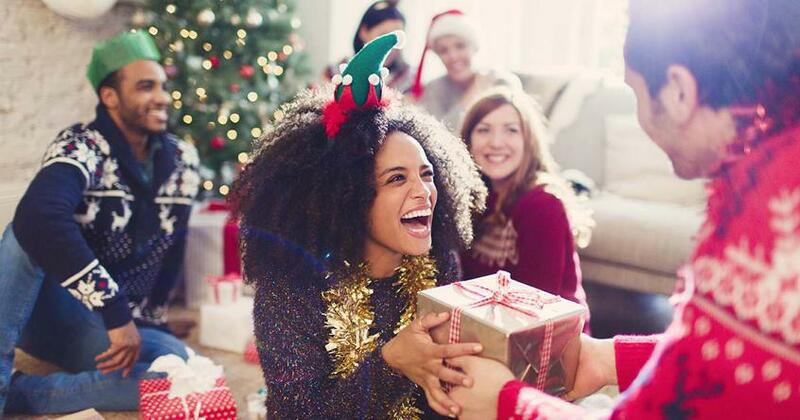 You’d be surprised by how much money people drop on things like Christmas trees, tinsel, lights, stockings, ornaments, garland, tree skirts, table runners, holly, figurines, wreaths, holiday lawn figures . . . and a partridge in a pear tree. Oh, and don’t forget all things Santa, reindeer, snowmen, gingerbread, snowflake or nativity themed. But believe it or not, your decorations don’t need to rival Santa’s workshop in order to have a good Christmas. Here’s a not-so-secret Christmas budgeting trick: use the decorations you already have! You can reuse ornaments, artificial wreaths and table runners year after year (because no one remembers, anyway). Purchase a few pieces and mix the old with the new. Maybe that includes a nice centerpiece for the dining room table or updated stockings to spruce up the mantle. Don’t forget you can kill two birds with one stone by making your own Christmas decorations. You can have a DIY decoration party to bond with your friends and family. And you’re saving money at the same time. Win-win! Bottom line? Try to buy only things you’ve budgeted for, which can include a new set of outdoor lights or an updated inflatable reindeer for the front lawn. The kids popped the one from last year, didn’t they? The sooner you start saving up for Christmas, the sooner you can start buying presents! Now if that doesn’t help spur you on, we don’t know what will. And by starting early, you’ll actually have the time and the energy to find the best deals out there. Everyone knows about Black Friday and Cyber Monday deals, but the truth is, a lot of stores start offering discounts to Christmas shoppers much earlier than that. If you already have the cash in your pocket, you can get a jump start on saving and being done with your entire Christmas list. You might even be able to finally DIY a few gifts to save you even more money! But remember, you’re not out there shopping blindly. You already made your Christmas shopping list. You know exactly how much money you’ll spend on each person on your list. Christmastime means more visitors at your house—which means more use of your water, electricity, gas and heat. Brace yourself for higher bills thanks to more showers, more rooms with lights turned on, and more dishwasher and laundry loads. Ask your guests to help you keep costs down by waiting until they have a full load of laundry before running the washer, only running the dishwasher once it’s full, and using paper plates to keep said dishwasher from constantly running. If you don’t want 90% of your paycheck going toward your electric bill, don’t go all Clark Griswold with your lighting display. The last thing you need is to get swept away by the sparkle of those dazzling lights! For every minute they’re on, dollar bills are floating out of your pocket like fluffy snowflakes. 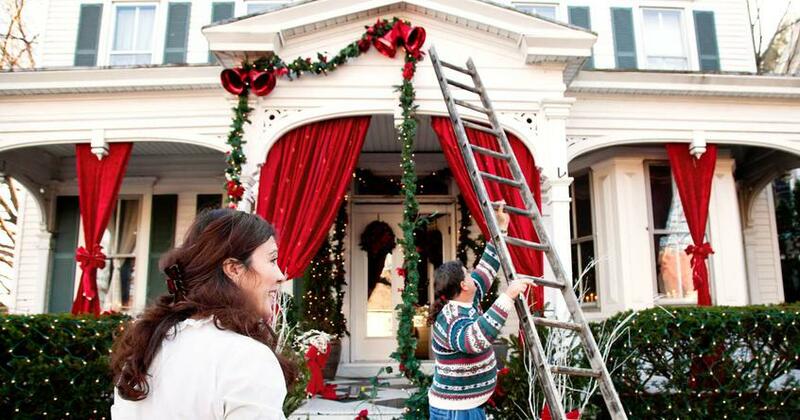 We’re not saying you should have zero lights decked out on your house—just keep it in check! Use timers to control how long your outdoor lights stay on. Leaving the bulbs burning until the sun comes up won’t put you on Santa’s Nice List. And make sure the lights don’t come on too soon either. No one will be able to see those lights in their full splendor if the sun is still up. You can also use an automatic timer for your indoor lights if you don’t usually remember to unplug them before you go to sleep. Lower temperatures also mean higher heating bills. Keep your wallet from getting burned by upping the amount you budget for your utilities. You’ll be prepared for the higher bills, plus you’ll get a nice little Christmas treat if it ends up costing less than what you planned! This one always sneaks up on us, doesn’t it? You might start off the Christmas season set on not doing the whole Christmas card thing. But then you get one in the mail from your cousin who had a baby this year, and seeing that newborn in a Santa hat reminds you how much your own kids have grown. The next thing you know, you’re searching online for the best family poses for Christmas card pictures—with matching outfits, of course. Disclaimer: It’s okay not to send out a Christmas card. Nobody says you have to do it. Sharing a photo of your family on social media with a “Merry Christmas from our family to yours” caption is perfectly fine. Find a nice family photo from the year. It could be a casual vacation photo from your summer trip to the beach, everyone dressed up at your daughter’s dance recital, or your family reunion picture. If you had a big life event this year—you got married, had a baby, or bought your first home—take advantage of that! You can make cards easily by using apps on your phone or online at CVS Photo, Shutterfly or even Vistaprint. If you only need a small amount of Christmas cards, these sites often offer promotions that give you 10–15 cards for free. All you have to do is pay shipping. You can even opt for a postcard instead of a traditional card with an envelope. This will save you money on the card itself and the postage. Honestly, this is the cheapest option. You can buy festive paper and handwrite (or print) a heartfelt note. Or you can buy a 25-pack of variety Christmas cards from nearly any store out there. Even dollar stores sell them (gasp)! And don’t worry about them being “too plain and simple.” Truth is, nobody wants to open up a card to find 12 days of glitter spilling onto their floor. Everyone loves Christmas treats. But you don’t have to spend a small fortune on super sugary, Instagram-worthy desserts from that boutique bakery on Main Street. Instead, make your own sweet treats! It’s easy to whip up some peppermint bark, fudge, sugar cookies or your own tasty family tradition! Grab some sweet toppings like icing, candy canes and sprinkles too. 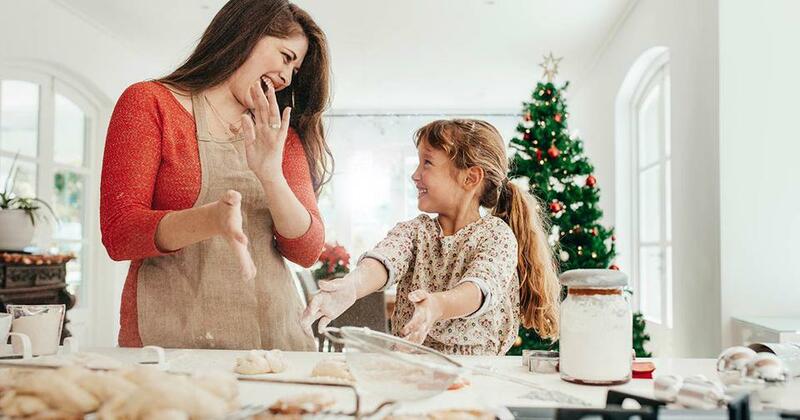 Spend an afternoon baking and decorating the goodies while listening to your favorite Christmas songs. It’s a great way to get yourself into the Yuletide spirit. 2. Have a Christmas movie marathon. Skip dropping $100 at the movie theater on tickets, dried-up Junior Mints, and stale popcorn. Who wants to be in a crowded theater when you could be curled up on your own couch, anyway? Instead of taking a risk on the latest holiday movie at the cinema, stick with the classics. 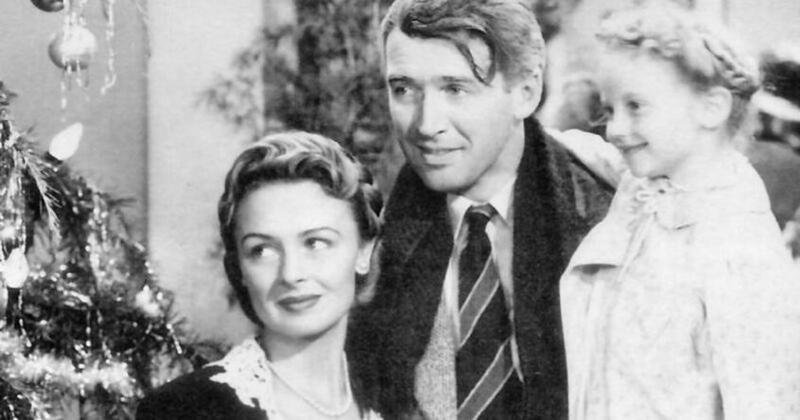 From It’s a Wonderful Life to Elf, there are tons of Christmas movies you can stream online or check out from the library. Pull out the cozy blankets, pair those yummy cookies with some hot chocolate, and gather the family for a merry movie marathon. 3. Make your own crazy Christmas carols. This is just like Mad Libs but with a holiday twist. Black out certain words in your favorite Christmas songs. Ask your family members to suggest nouns, verbs, numbers and so on. Then sing the new lyrics and get your creative caroling on. 4. Have a sock snowball fight. Gather every pair of (hopefully clean) socks you can find and ball them up until they’re the size of snowballs. Then move some furniture, pile the socks in the center of the room, and let the battle begin! Oh, and keep your head down. 5. Go on a scavenger hunt. Make a list of holiday items for everyone to find—maybe a stuffed reindeer, a 7-foot tree, or a roll of wrapping paper with snowmen on it. Spend the day searching and determine a prize for the person who locates everything! 6. Look at Christmas lights. Basking in the glow of beautiful Christmas lights is a timeless family favorite. Make some hot chocolate, toss it in to-go cups, create a Christmas playlist, and hit the road to take in the holiday lights around your neighborhood. 7. Go to a Christmas tree lighting or parade. Free community events are everywhere during the Christmas season! Check your local area to see if there’s a town tree lighting or Christmas parade to help you keep the spirit alive. It’s frugal. It’s festive. It’s fantastic. 8. Put on a play. Help your kids reenact the story of the first Christmas, The Grinch, or whatever their favorite Christmas story or movie is. Gather up some costumes and put on a show with the kids! You can even film it with your phone and send it out as an e-card. You can’t get much more adorable than that. Ever heard of this one? For those of you who will actually see snow this year, this one’s a great activity! All you need is food coloring, a spray bottle, and some water and you’re good to go! You and the kids can use your DIY “paint” to endlessly color that white, crisp snow. Sure, you can always build a snowman. But since Frozen already dominates the world, do you really want to leave the door open for the kids to start singing that song again? 10. Pick out a Christmas tree. If the real-deal tree is your thing, then you probably already have this one in your Christmas budget. Buying a real tree is a fun and memorable experience for the whole family. Pick out the perfect tree and then get ready to sing “O Tannenbaum” on the car ride home. 11. Make DIY ornaments or keepsakes each year. Family traditions don’t have to cost you an arm and a leg. 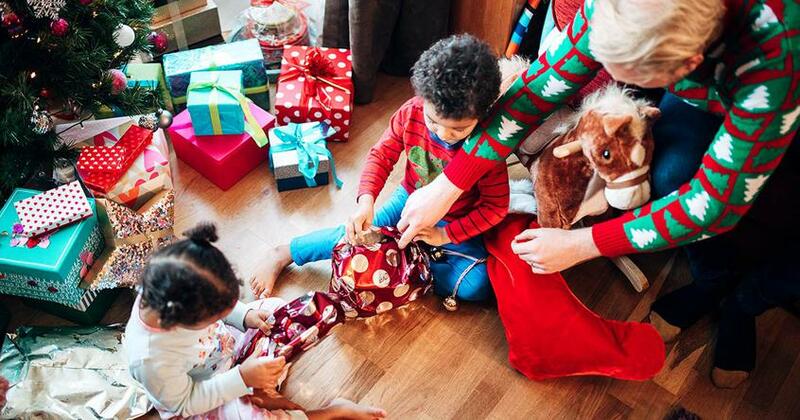 You can create affordable family traditions to keep up with each year. One great option is making your own ornaments. There are so many unique and affordable DIY ornament ideas out there! All you need is some glue, string and a little imagination. Another great family tradition is making salt dough handprints with your kids every Christmas. As you look back, you’ll see how much those tiny hands have grown throughout the years. These make great gifts to give to the grandparents too! Sorry, we can’t be held responsible for how much this tradition might make you tear up. If you want to truly experience the magic of Christmas, give back to those who could use a little Christmas glow to warm their hearts. You can volunteer to serve at a soup kitchen, sing Christmas carols at a nursing home, or fill a shoebox to give to a child in need. There are plenty of ways to enjoy the Christmas season with a limited budget. A merry Christmas doesn’t depend on how much money you spend. It’s about the people you’re sharing time with and the memories you’re creating along the way. Anyone can do it—no elves required. You can still have a meaningful Christmas while sticking to your budget! Keep track of your Christmas budget on the go with our free budgeting tool, EveryDollar.